We can’t believe we’re already in November! It feels like it hasn’t been that long ago, that everyone in the world was looking forward to shopping the best online sales for Thanksgiving, Black Friday and Cyber Monday! In fact, the United States celebrate “Thanksgiving” almost as big as our Hari Raya or Chinese Lunar New Year celebration, and the following days, Black Friday and Cyber ​​Monday will make online shoppers go crazy. It feels like the whole internet is on sale with discounts of up to 70% or more! You think the discounts only apply to American online shops? All global online stores, including the United Kingdom, Japan and other places will participate in the Black Friday sales, so mark this day (23 November) in your calendars, and shop everything from American and Japanese brands to British brands and home appliances! And if overseas online shops only offer national shipping or high shipping fees to Asia, Buyandship will ship them for you! Simply send your purchases to our overseas warehouse closest to your retailer and we will deliver your Black Friday orders to you! Plus we ship them quicker than the online shops! This year November 23, US time, will be the most important day of the year for all shopping fans! Half price off? 75% off? Stop! All major online stores will launch a “One Day Deal” or “24 Hours Flash Sale” and other limited-time offers on this specific day. If you have the chance to shop your favorite online shop on a discount, you definitely don’t want to miss out. The West Coast and East Coast of the United States have a time difference of three hours, and most of the online stores will start the discount according the time of the West Coast (also known as PST or PT). 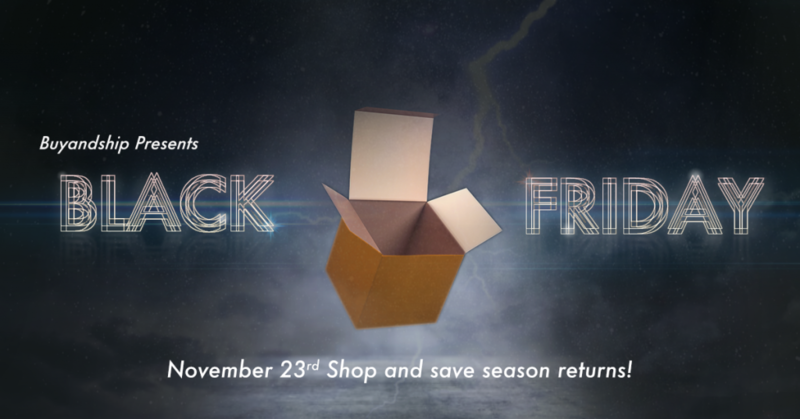 This year, Black Friday will start at 0:00 on November 23, PST time, which is 1 pm on November 24, Malaysia time. (But of course, discounts might also start early!) Some online stores in the UK and Japan will start their Black Friday offers on November 23, local time. It is also good to note that the East Coast is usually referred to EST or ET is 3 hours ahead of PST. If you want to be well prepared you should open a customer account at the online shop and create a wishlist! So everything will be just a click away from your shopping card, when the discount begins and you can quickly check out! And if you want to be even quicker, you already fill in our warehouse address, when opening the online store accounts! Some overseas online stores accept overseas credit cards, while the popular luggage brand Samsonite or the footwear brand Toms only accept Paypal as a payment method. In order to avoid being stuck during the payment process, you can apply for a Paypal Account prior to the Black Friday period. At the same time, remember to prepare multiple valid credit cards in advance. Keep your eyes open, to different prices on different websites! If you are eyeing one pair of sneakers, don’t forget to check out all the online shoe shops, and not only the official website! Sometimes the popular shoe stores such as Eastbay, Footlocker, Shoes.com, etc. offer higher discounts than the official websites. 6. Don’t forget to add your cashback extensions! If you’re looking for the ultimate saving, don’t forget to add cashback extensions on your chrome browsers, so that you can get up to 10% cashback from certain websites! Most of the US websites do not provide shipping services to Malaysia, such as Amazon, Ralph Lauren, GNC, Carter’s, Eastbay and other online stores will only ship within the US. Therefore, Buyandship is here to help you! Sign up with us, send all your purchases to our overseas warehouse addresses and we will deliver them to Malaysia for you! When shopping during Thanksgiving, Black Friday and Cyber ​​Monday, every second counts! Save precious time and pre-fill all the shopping websites with our closest overseas warehouse address. When you checkout, you can be a step faster than everyone else ~ And the quicker you have made your purchase, the sooner your shipment will be at our warehouse and then ready to be delivered to you! And to make the process even quicker and efficient, please pay attention to the following few steps! During the shopping season, remember to keep your US parcel size limited to height/width/depth measurement of NOT more than 150cm, otherwise the shipment will rejected and cannot be transferred to Hong Kong and subsequently to Malaysia. If an error message occurs when trying to fill out our overseas warehouse address, you can try to enter 595, North Columbia Boulevard in another format. If there is no space to add your Buyandship member number to your name or your address, please try to add it elsewhere within the address boxes. For example to the “Address line 2”. (It’s important to add in your BNS member number for identification of your parcel). Prepared online-shoppers must have valid credit cards and a Paypal account , as most of the online stores accept either or! If you want to use the warehouse address as your Billing Address, please use your real name (excluding MY as the first user name); in case the warehouse address fails as a Billing Address, then you can use your own real address as the Billing Address. After you’ve shopped, remember to declare your parcels! As long as you remember to declare the shipment on time and accurately (before your shipment arrives at the warehouse), our United States warehouse will work hard and try their best to arrange the check-in of every parcel as quickly and efficiently as possible. However, because of the large increase in the volume of goods, there might be a chance that the parcel can only be checked in after the third working day of its arrival the US warehouse. So, appreciate if you could be patient and contact our Customer service, in case your parcel hasn’t been checked in after a few days. If you have not declared the shipment after it’s arrival at the warehouse, the warehouse colleagues will delay processing your shipment for 3-5 working days, and priority will be given to the already declared parcels. BuyandShip is offering a customer-oriented service and usually we are able to answer your inquiries within 15 minutes, but due to all the messages and inquiries we will be getting during Thanksgiving please expect an average of 1-2 hours for an answer to your questions; During the non-office hours please expect your questions to be answered as soon as possible, although because it is a weekend, allow up to the next day for our customer service to reply.Thank you for your understanding and patience in this matter! During this very busy discount period, it might take 1-4 days longer than usual for you to receive your parcel. As usual, around this time of year we are expecting a lot of shipments during Thanksgiving/Black Friday/Cyber Monday, and although the whole Buyandship team is ready to help out with all the boxes and packages, we will still need the cooperation of you, our members, to be able to deliver the parcels as quickly as possible!